There still isn’t much to be happy about when it comes to the political conversation in Lansing, our state capital. Though she won more than 50 counties in the 2006 election, more than any Democrat running for any state office in Michigan history — she also delivered a Democratic-led House; Republicans hold the state Senate by a slim majority — Michigan’s governor hasn’t done anything with her influence. Politics is a full contact body sport. Ms. Granholm, though, has spent more than four years convinced that politics is a courteous waltz. And the more she dances, the further Michigan slips. In an era defined by educational achievement, Michigan drains resources from its public schools and universities, yet battles to retain the same number of incarcerated state prisoners at more than $30,000 each a year. In an age when more miles of rapid transit determines regional and state economic health, Michigan is doing nothing — repeat nothing — to help the Detroit region actually use the $100 million set aside by Congress to build a starter heavy commuter rail line between Detroit and Ann Arbor. And in a century when clean, renewable energy is the order of the day, Michigan state government and the governor’s office appears more than pleased to foster the development of two new power plants that use 19th century technology and an 18th century fuel source — coal. It is for these reasons and more that at least one of the state’s prosperouos regions — Grand Rapids — has largely decided to avoid state government officials and political leaders to advance new economic development strategies that are producing jobs, higher incomes, an enhanced quality of life, and real prospects for its citizens in this century. I spent the day in Grand Rapids last week and every time I go I find something new and impressive. This time I discovered a medical and biological research construction boom had overtaken Health Hill on the city’s north end. From the summit of the hill, and stretching roughly half a mile in both directions along Michigan Street, a stunning array of buildings is under construction, reflecting a commitment of nearly $1 billion by the area’s prominent families and medical institutions. There are a new medical school, a children’s hospital, a biomedical research center, a cancer treatment center, and two medical treatment and office buildings. All told the buildings will cover 1.2 million square feet. 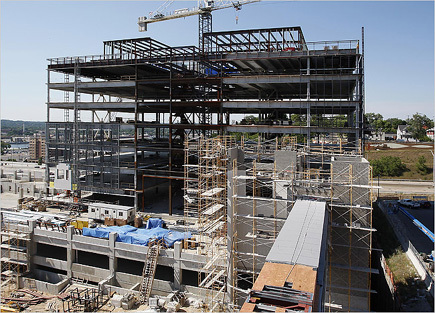 By 2010, when construction is completed, those buildings, several designed by world-renowned architects, will provide enough space to treat thousands of people a day and employ 5,000 people, 2,500 more jobs than exist now on Health Hill. Grand Rapids may be executing the largest biomedical and patient care construction project in the United States at the moment. I could find only two other projects of near the same magnitude — one at the University of Kentucky in Lexington, which is building a $450 million hospital that is part of a 20-year $2.5 billion medical campus construction program, and a $160 million building that was just finished by the Oregon Health and Sciences University in Portland, the first of three big buildings it plans to construct in the city’s new South Waterfront section. In essence, Grand Rapids has developed its next big new strategic economic thought around biological research and medicine, focusing on patient care and cancer research. A city that was founded on cutting down trees, later developed furniture, evolved into manufacturing, has found a way to shed its rust belt image by developing new means to treat the sick and prevent disease. My colleague at the Michigan Land Use Institute, Andy Guy, has written about Grand Rapids’ ascent more expertly than any journalist in Michigan. A last thought. Grand Rapids accomplished this feat by joining the vast wealth of its industrial families, many of them ideological conservatives, with the progressive ideas of its city government, neighborhood organizations, non-profit civic groups, and academic institutions. Partisanship wasn’t an issue. Neither was ideology. Collaboration in a collaborative century was the watch word. Big ideas were hatched and are being achieved. Grand Rapids is little more than an hour’s drive to Lansing. You wonder why the smart people there are having such a hard time with this. Pondering your piece and the mixed metaphors I perceive, on the one level Civic action, on the other State wide politics. Better comparison would be Grand Rapids vs. Detroit? I say this having “grown up” in the Lansing area, and serving my time with Economic Development players and issues during the decade of the ‘90’s. Your comments triggered thoughts comparing civic development between Grand Rapids and Lansing. Here I think you hit the nail squarely on the head: Sponsorship. Grand Rapids has private wealth with a commitment to preservation and redevelopment of the city and community, Lansing seems to lack that. I’m now removed from Lansing, and may be missing some key points, but my perception is that, especially since General Motors moved the executives (aka Oldsmobile) from the city, there is little in the way of rooted “wealth” in the community. Lansing is build on manufacturing (now Cadillac), State Government, nearby Michigan State University, and increasingly Insurance and Health Care. State Government and the University do not generate long term wealth effects. Insurance and Health may someday, but not yet. Grand Rapids has business that generates wealth outside the city, and reinvests it in the community, I’m not sure that Lansing has the same. Now the here’s where the metaphor can apply. Michigan use to generate wealth outside the state, via the Auto Industry, along with others, as you point out, lumber, furniture etc. and was able to reinvest within the state-wide community. A question that I would have with regards to Grand Rapids, what is the tax environment? Are there incentives to private investment, or is it more of a matter of civic pride, civic interest in the community? My libertarian bent here: it’s public/private partnership driving the development, not tax policy. You’re both right. The big project successes in Grand Rapids are mainly a byproduct of an attitude of civic pride and competitiveness, moreso than tax policy. If you look at much of the Health Hill developments, they are being spearheaded by the big Grand Rapids families: Rich Devos (the RDV/Christman medical complex), David Van Andel (Van Andel Institute), Fred and Lena Meijer (Lemmen Holton Cancer Pavilion), and Peter Secchia (MSU Med School head donor and cheerleader). Although most of these projects have requested and received tax credits available through the State and the city, it was more of “icing on the cake” than the determining factor. Many of the other project too, like the new art museum, new JW Marriott, Civic Theater renovation, Peter Wege Ballet Theater expansion, and many others, would not have happened without the major support of local business owners and philanthropists. However, if you look at the myriad of small development projects, from schools being made into lofts, to high-rise condo towers, to expanded microbreweries, those projects could not have happened and would not happen without Renaissance Zone or Brownfield Tax Incentives. Most of those have come from local developers who are energized by the rising popularity of downtown Grand Rapids, but they have also drawn interest from developers from the Chicago, Buffalo NY, and NYC areas. One thing that is interesting to note as well is that Grand Rapids has had the most success with the Renaissance Zone program than any other city in Michigan, including Detroit. So perhaps tax policy is only PART of the solution (icing on the cake) to business expansion, redevelopment and job creation for Michigan.